On Friday 11 April, Elaine Embleton met with Roger Clarke, to donate an orginal copy of Balgarnie's Salt, the biography of Sir Titus, written by his friend the Rev. Balgarnie, to the Saltaire Archive located in Shipley College Resource Centre, Exhibition Road. Roger was suitably attired as the historical figure, the Rev. Cowan, which he plays when conducting tours around Saltaire on behalf of Salts Walks. Roger was delighted with the donation and the condition of this first edition copy, which is valued at around £100. Mouse over image to enlarge. Elaine Embleton (nee Dutton) now of Heckmondwyke, but originally from Belmont Close in Baildon, asked her friend Maureen Ramsden to arrange for this volume to be donated to the archive. Elaine spent her childhood at Belmont Close in Baildon. Some of you may remember her as Elaine Dutton at Sandal primary school or at Bingley Grammar School. She came to know Saltaire and surrounding district very well. She married a Birkenshaw lad in 1953. His father was employed on the Union Castle Line and travelled the world, encouraging the newly married couple to consider emigrating. They lived in Cape Town until 1977, when they returned to Britain. The Balgarnie was bought from a Cape Town bookshop for 1 shilling and 3d. Elaine has no idea how it came to be on sale there, but it was a memory of home for her. Unfortunately Mr Embleton died 2 years ago. This original copy is in very good condition. It has the original photographs which were stuck into the book, including one of Titus Salt's statue when it was in front of Bradford City Hall, before being moved to its present home in Lister Park. 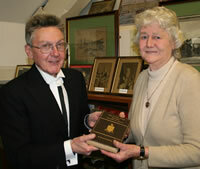 Dave Shaw, local historian, has confirmed the importance of this donation to the Saltaire Archive. It was the scarcity of the book that prompted Philip Barlow and himself to republish the original text in 2003 as "Balgarnie's Salt" with detailed footnotes and appendices. Balgarnie's account continues to be a vital source of reference. Julie Woodward, Manager of the Shipley College Resource Centre, which houses the Saltarie Archive, expressed her gratitude to Elaine, who is seen here handing the book over to the Reverend Cowan (aka Roger Clarke). Julie hopes to feature the gift at the Salaire Archive Exhibition which has its annual opening from 15 July to 15 August this year. The Archive has been fortunate in receiving a number of substantial donations of photographs and documents over the past year, and they will be on display for the first time in July. We are all grateful for Elaine's generous gift.